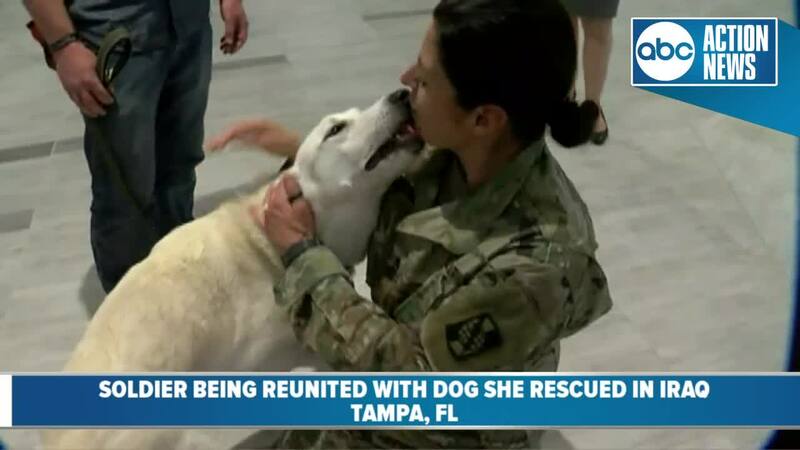 A Florida soldier is finally reuniting with a dog she rescued while she was deployed in Iraq in 2017. U.S. Army Reserve Sgt. Tracy McKithern of St. Petersburg said she first laid eyes on a the little puppy as it sniffed around the base with its mom. McKithern said the puppy and the mom were clearly starving, and abused by locals, kicked and hit with rocks everyday. They were covered with dirt and scratches. The puppy had two siblings, but McKithern says they both disappeared. It didn't take long for the puppy and her mom to realize they were safe near the base, and would be fed too. As weeks went by, the puppy and its mom both gained weight and their wounds started to heal. "She loved everyone," said McKithern. "She is the sweetest little soul. She came up to me immediately, probably hungry, but gentle. I think she was looking for love more than anything else." McKithern named the puppy Erby Kasima. Erby, after the the largest city in Northern Iraq, Erbil and Kasima, the Arabic name for "beauty and elegance." McKithern says she along with soldiers from Italian and German armies her unit was partnered with, began taking care of the dogs. 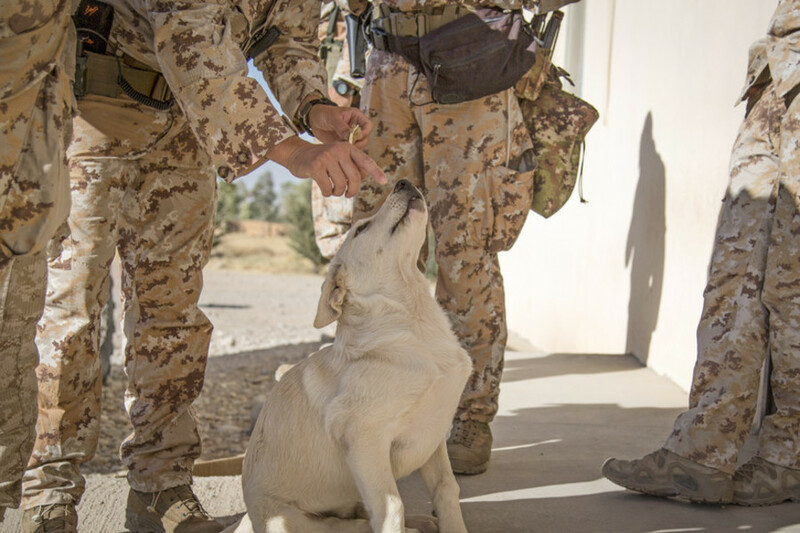 McKithern was totally in love with Erby and says the puppy was always waiting at the base for them to return when they'd go on missions. But towards January 2018, as her one-year deployment was expected to end, McKithern couldn't imagine leaving Erby behind. She decided to post a picture of the dog to Facebook with the caption, "I wish I could take her home." "I went to sleep, woke up and my friends and family had posted links to various rescue groups. I reached out to one of them and they responded immediately," said McKithern. She got in touch with one and sent them $1,000 to get the ball rolling. "A complete stranger donated $1,000 and it was around Christmas, so it was like a cute note, like Merry Christmas, or Happy New Year, it was amazing," she said. The non-profit, Puppy Rescue Mission, raised the rest of the money needed, which was $3,500, from complete strangers. McKithern was beyond excited and grateful. But before Erby could leave, she needed vaccinations, documentation, and travel arrangements which became a daunting task for McKithern, who still needed to fulfill her duty as a soldier. She started to get worried the rescue wouldn't pan out. Instead, her German and Italian friends stepped up, promising to tie up any loose ends and get Erby on the plane. Erby was set to arrive JFK airport on March 11. Just days before, McKithern got word she would be deployed that SAME day, on a 67-day mission to Fort McCoy, Wisconsin. She wouldn't be able to greet Erby, let alone see her for another two months. I was pretty sad, I mean I mention to my husband quite a few times, I love the Army and what we do, but I was pretty sad," she said. On Wednesday McKithern came home and was reunited with the dog she fell in love with and saved. 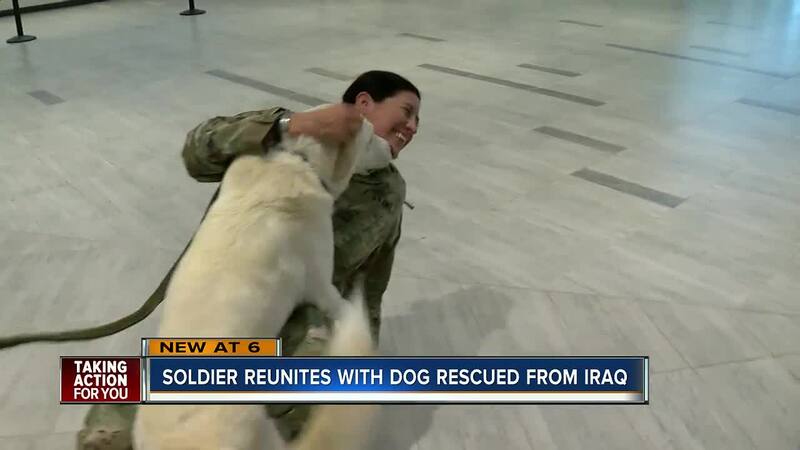 She says none of this would have been possible without the help from strangers, and the friends she made in Iraq at her base. "I can't believe it," said McKithern. "It feels like a miracle is happening." Erby's mom is still in good hands being taken care of on the base, but McKithern hopes she can get adopted as well. Unfortunately it costs thousands of dollars to bring the dog to the United States, but she is optimistic Erby's mom will be adopted too. For more on McKithern's story, click here .